A device for patients with advanced heart failure. You are being considered for an LVAD. 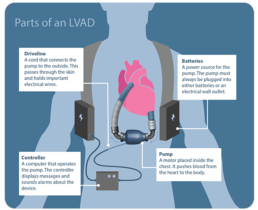 This page is designed to help you understand what an LVAD is and to help you, your family, and your doctors think about what is best for you. Your values and goals are the most important factors in making a decision. What is an LVAD ( Left Ventricular Assist Device)?